FREE access to our traffic & ROI projection tools. This is, by far, the #1 question I get asked during sales consults for my agency. Realistically…there’s no way to know for sure. However, if we use the data we have available, we can get pretty damn close. This article will cover ROI forecasting methods for SEO. This post is part 2 in our series about projecting organic traffic. Please refer to our Part 1 on how to forecast SEO growth before moving forward here. This topic is a little dry – please check out the video (in the header) and the slide deck (below) for a visual walkthrough of this material. Focusing on the change in organic revenue ensures we’re looking at the potential impact of our services. It’s not fair for us to claim ALL the revenue coming from organic search, we should be focusing on the revenue we drive as a result of our services. For the purpose of this article, we’ll set the “Cost of SEO” to $60,000/year ($5k monthly retainer). Next we need Projected Δ Organic Revenue. This calculation would apply to any website that sells products / services directly on their website, think Nike, Fiver or Target. Our job is to find the Projected Δ Organic Revenue – this requires some additional inputs. We can get Current Organic Traffic from Google Analytics. Make sure you set the date to a full year’s worth of data – keep this date consistent throughout the entire process. We can get Growth Rate from the our organic traffic projection tool. I like to use growth rate #2 – Improve Existing Keywords. This keeps the projection more reasonable. You can plug that figure back into the previous equation. We can get all of the remaining inputs from the Conversion reports in Google Analytics. 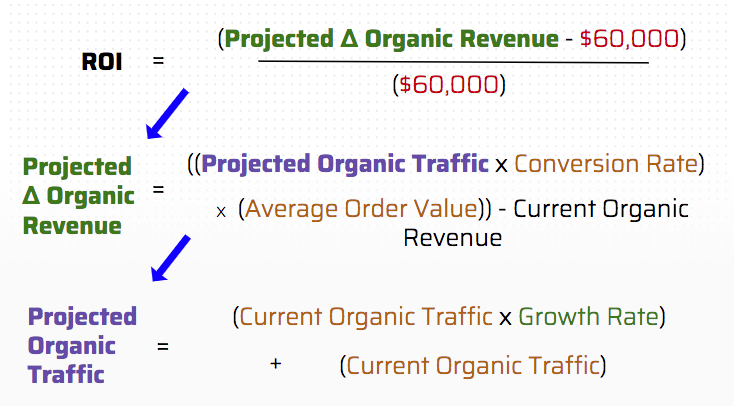 Finally, we have the Projected Δ Organic Revenue which will allow us to calculate the official ROI. In other words, if this company were to pay us $60k yearly for our SEO services, we’d deliver over 900% return. This calculation would apply to any website that collects leads via their website, think an Attorney or SEO agency. This one is more challenging because we don’t have sales data readily available – we need to calculate it. Let’s start with finding the Projected Organic Traffic – we can get all the data we need from the Landing Pages report in Google Analytics. Plug that 230,782 back into our Projected Δ Organic Revenue formula. Now let’s find the Lead Value. The final piece is finding the Current Organic Revenue, aka the amount of yearly revenue generated from organic search channels. If the website you’re running this for has a CRM, you can grab this information there. If not, we can calculate it. A much more complex analysis, but leading to the same conclusion. As you can see, this can be a bit of work. Make sure to grab the template we built for you. It handles all the math for you, all you need to do is give it a handful of inputs. We also included a breakeven analysis in the templates. This tells you the exact amount of sales / leads and traffic needed to “break even” on the cost of your retainer. Got questions? Drop them below or sign up to get FREE access to our private Slack Channel.